The Nifty, which started with a gap-up on Friday, continued its journey of making higher highs and higher lows and closed above its crucial resistance levels of 10,785-10,800 on daily charts. The index formed a bullish candle on the daily as well as weekly charts. Formation of a bullish candle negates the formation of a bearish candle formed in the previous trading session. Hence, investors are advised to stay cautious ahead of the Karnataka election outcome next week. Level of 10,785 which acted as a crucial resistance level for the index this week will now act as a crucial support for the index. Hence, a break below this level could open room for bears to enter. “The market appears to be defying gravity as it registered a strong bullish candle both on daily as well as weekly charts thereby negating the bearish technical formations witnessed in Thursday’s session,” Mazhar Mohammad, Chief Strategist – Technical Research & Trading Advisory, Chartviewindia.in told Moneycontrol. “However, Friday’s rally is on the back of weak advance-decline ratio which remained skewed in favour of bears. 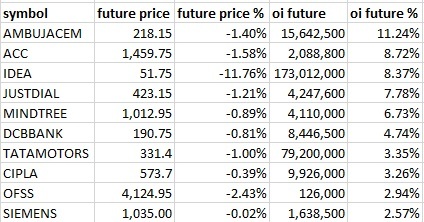 Besides, the rally appears to have driven mainly by financials and metals whereas all other indices either remained flat or registered a negative close which should be a cause of concern,” he said. India VIX fell down by 3.07 percent at 13.97. A decline in VIX ahead of the event suggests that participants are not much worried from the outcome of the Karnataka Election result. However, VIX is near to comfort zones of 13.50 and post the event OTM option can decline sharply because of a dip in volatility, suggest experts. The Nifty closed at 10,806.5 on Friday. According to Pivot charts, key support level is placed at 10,750.0, followed by 10,693.5. If the index starts moving upwards, key resistance levels to watch out are 10,837.5 and 10,868.5. The Nifty Bank index closed at 26,413.2. The important Pivot level, which will act as crucial support for the index, is placed at 26,196.27, followed by 25,979.34. On the upside, key resistance levels are placed at 26,533.67, followed by 26,654.13. 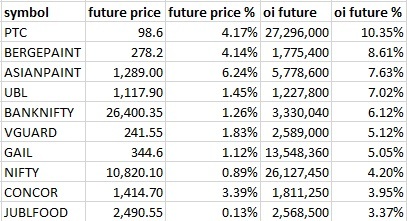 In terms of open interest, the 11,000 Call option has seen the most call writing so far at 59.90 lakh contracts. This could act as a crucial resistance level for the index in the May series. The second-highest buildup has taken place in the 10,800 Call option, which has seen 35.05 lakh contracts getting added so far. 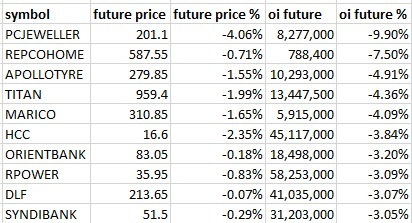 The 10,900 Call option has accumulated 32.07 lakh contracts. Call writing was seen at the strike price of 11,200, which shed 2.44 lakh contracts, followed by 11,100, which added 1.83 lakh contracts as well as 11,000, which added 1.63 lakh contracts. Call unwinding was seen at the strike price of 10,900, which shed 3.58 lakh contracts, followed by 10,700, which shed 2.41 lakh contracts, and 10,600, which shed 70,575 contracts. Maximum open interest in put options was seen at a strike price of 10,600, in which 63.18 lakh contracts been added till date. This could be a crucial resistance level for the index in May series. 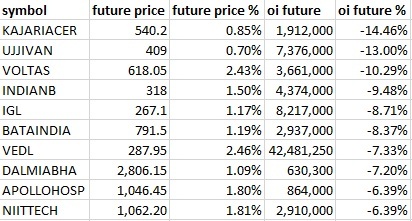 The 10,600 put option comes next, having added 47.39 lakh contracts so far, and the 10,700 put option, which has now accumulated 43.81 lakh contracts. Put writing was seen at the strike price of 10,700, which shed 12.46 lakh contracts, followed by 10,500, which added 8.54 lakh contracts, and 10,300, which added 6.29 lakh contracts. There was hardly any Put unwinding seen. 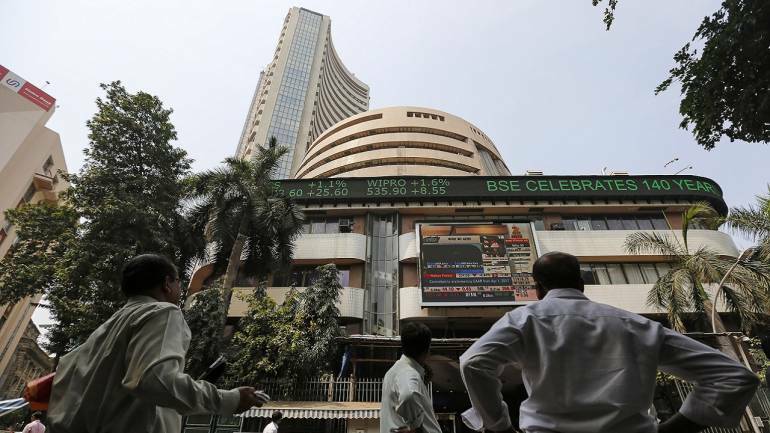 Foreign institutional investors (FIIs) sold shares worth Rs 325.44 crore, while domestic institutional investors bought shares worth Rs 1,163.35 crore in the Indian equity market, as per provisional data available on the NSE. 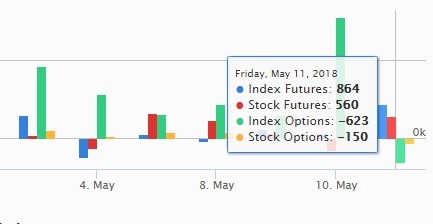 An increase in open interest along with a decrease in price mostly indicates build-up of short positions. Just Dial: Shaastra Securities traded 5.3 lakh shares at Rs 414.5. PC Jeweller: Vaibhav Stock and Derivatives traded 38.4 lakh shares at Rs 213 apiece. NK Securities traded 26.9 lakh shares at Rs 215.76 apiece. Rain Industries: BNP Paribas Arbitrage sold 18.9 lakh shares at the price of Rs 277.4 per share. Balaji Telefilms: The company will hold an earnings call on May 21, 2018. Shriram City: Janchor Partners will be meeting the firm on May 14, 2018. Mahindra Finance: The company will be meeting multiple investors between May 14 and 29, 2018. Canara Bank: Sharp rise in provisions widens the bank’s net loss to Rs 4,859 crore. Graphite India: Net profit soars to Rs 453.7 crore. UCO Bank: The bank has widened its net loss to Rs 2,134 crore. Oriental Bank of Commerce: Net loss for Q4 widens to Rs 1,650 crore. Security in ban period for the next day's trade under the F&O segment includes companies in which the security has crossed 95 percent of the market-wide position limit. For May 14, 2018 stocks such as Balrampur Chini, DHFL, IRB, Jet Airways, and Wockhardt are present in this list.